Scouts from the both the World Junior A Challenge squads (Team Canada East and Team USA), where many of these players will vie for a spot in the selection camp, as well as many from the NCAA and other colleges, filled up the rinks. Ten squads from five Junior A leagues played 40 minute games in the city of Quinte West, home of the Trenton Golden Hawks, located between Toronto and Ottawa on Lake Ontario. It was a team from the QJHL who came out victorious, as LHJQ St. Louis won 4-2 in the final over CCHL Red thanks to three points from Matthew Newbury, who sealed the game with an empty netter. Newbury, an 18-year-old who played 28 games in the QMJHL last year, raised his stock with a strong final performance. LHJQ St. Louis went 5-1 across the three days, notching 15 goals for and just six goals against. Their championship game counterpart, CCHL Red, were 4-2 but couldn’t pull through the final. Jason Clarke, the head coach for CCHL Red and the Carleton Place Canadians, had 12 of his players from the Canadians on CCHL Red, but said he didn’t see a clear advantage. “I think it gives some familiarity in the room but other than that, all the guys are playing well, especially guys from other teams who have played fantastic so far. It’s been a pleasant surprise to see the kids gel,” Clarke said during day two of the tournament. He noted the extra jump in the strides of players knowing they needed a big tournament to draw eyes and interest. “Guys are very professional and they are all trying to make their impression on scouts here for Team Canada East or NCAA. They’re all doing a really good job,” Clarke said. Having evaluated the tournament the past two seasons as a coach for the World Junior A Challenge’s Team Canada East, this was Clarke’s first time behind the bench. 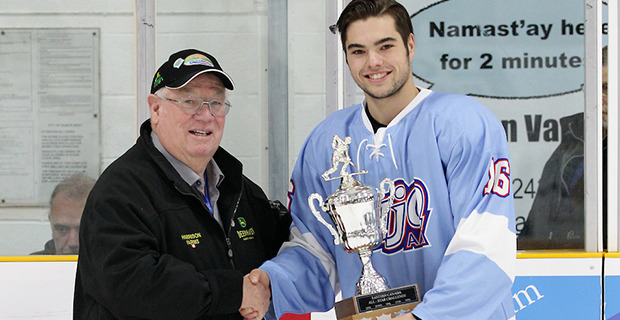 CCHL White’s Zachary Salloum led the tournament in points with seven and tied for first with three goals. He’s a 2018/19 RIT commit, so he was more so playing himself into Team Canada East consideration. Uncommitted players who had strong tournaments include Samuel Knoblauch, the leading scorer in the CCHL who had three goals and five points; Samuel Guilbault, who started the year in the QMJHL; Gabriel Morency, the goalie leader in the tournament at 5-0 and 0.80 GAA. ; and Christian Bardarson, top scorer of his NOJHL squad who ranks sixth in his league’s scoring. This is the seventh year of the event and third showing since it was renamed in 2015 as the Eastern Canada Cup Challenge. Ten teams played in the tournament: CCHL Red, CCHL White, LHJQ Burrows, LHJQ St. Louis, MHL, NOJHL, OJHL Coffey, OJHL Hawerchuk, OJHL Nieuwendyk and OJHL Oates. It’s grown over the years, but appears to be set at 10, especially once the Maritime Hockey League (MHL) joined two years ago. “The Ontario Provincial League have done a first class job with this. The community of Trenton should be really proud how the community has really rallied around this,” said Clark. Following the Eastern Canada Cup, Team Canada East got a better look at which players to invite to their World Junior A Challenge selection camp. Camp invites will likely be announced at the end of November before the camp takes place at the start of December. Coaches have already been named for both Canadian teams. Out east, Patrice Bosch is the leader for the first time after his time as an assistant with the team from 2008 to 2010. He has extensive coaching experience, including time in the QMHJL. Bosch is joined by Shawn Evans (Truro Bearcats), head coach of the host city’s Bearcats for 16 seasons, Marty Abrams (Trenton Golden Hawks) who led Team Canada East in 2014, Martin Dagenais, an assistant last year (Ottawa Jr. Senators) and John Dean (Toronto Patriots), former assistant with the OHL’s North Bay Battalion. Since the inception of the tournament in 2006, a Canadian team has been in the final every year except for 2013 and 2014. Canada West has won four championships, and the only other team to win is the United States, who have lifted the hardware seven times. Each year, the tournament is hosted in a different Canadian city that has a Junior A team. This year, it’s in Truro, N.S.